It's about time. That tiny phrase has been a common sentiment among Washingtonians in the aftermath of a February during which the state experienced a significant recovery in the mountain snowpack. After a disappointing and relatively inactive fall and early winter, Mother Nature finally began to repay the snow debt owed to the Cascades. A very stormy mid February time period brought copious amounts of critically needed snowfall to the mountains, along with significant rain to western areas, and mild and breezy conditions to eastern areas. The other big weather story of February was the early-month cold outbreak, which marked the second arctic intrusion of the winter season. High temperatures on February 7th were as cold as the mid teens in parts of eastern Washington, while several locations fell below zero at night. 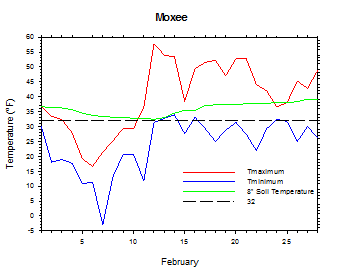 Prosser experienced its coldest February temperature (1 degree on the 7th) since the historic 1996 cold outbreak. 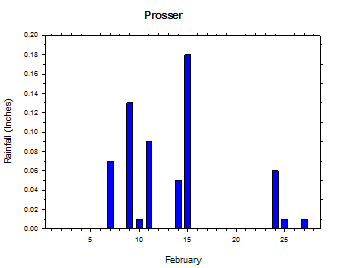 Overall, Prosser experienced its coldest February since 1996, and coldest February average high since 1993. It is also noteworthy that 2014 marks the first time in 20 years that Prosser's average high was cooler in February than in January. The winter season was generally cooler than normal as a result of the two arctic blasts. Early December was much colder than normal and mostly dry. However, a dirty ridge was anchored in place over Washington from mid December to early January. As a result, day-time temperatures were rather mild, and conditions were drier than normal, with only periodic weak storms passing through the region. Active and mild weather arrived for the second week of January, as a series of storms brought rain to western areas and wind and warmth to eastern areas. The latter half of January was mostly stagnant and dry, with cool and cloudy weather in the interior lowlands, and mild and dry conditions in the mountains and at the coast. The unusual chill of early February gave way to the stormiest period of the winter during mid February. Despite mild temperatures in the east, much needed snow fell in the Cascades, as notable rainfall affected western Washington. Finally, somewhat calmer and more seasonal weather closed out the month of February. 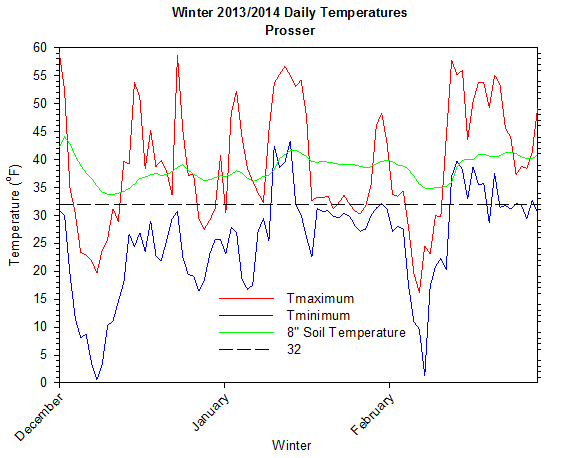 Overall, Prosser's average low temperature this winter was the coolest since 1992/1993. Even so, that fact is much more a testament to the recent lack of extreme cold than it is to this winter's chill. A weak weather system delivered light snow to some eastern areas on the 2nd and 3rd, while simultaneously ushering in a much colder and drier air mass. On February 4th, morning temperatures were around zero at the coldest spots. Lows on February 5th were as cold as -11 degrees at St. Andrews, while high temperatures struggled to achieve the mid teens in some eastern areas. Otherwise, strong northeast winds made for brutal wind chill values. On the 6th, highs were in the teens to around 20 degrees in the east and upper 20s to low 30s in the west. Lows dropped into the mid teens to mid 20s in the west, and negative single digits to low teens in eastern areas. Temperatures increased to the mid teens to mid 20s in the east, and upper 20s to 30s in the west on February 7th, though lows were still as chilly as -8 degrees at Wapato. Highs were as warm as the low 40s in the west on February 8th, though eastern areas remained in the 20s. Snow fell in southern areas of the state from the 6th to 8th, with the heaviest amounts in southwestern Washington. Heavy snow also fell on the evening of the 8th in south central Washington, with 6+ inches accumulating around Yakima. High temperatures broke 50 degrees in the west as rain returned on the 10th. 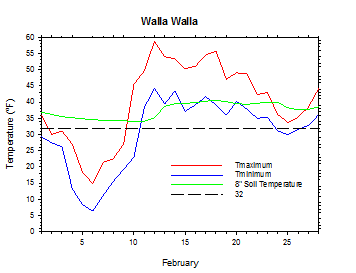 Most of the east remained in the mid 20s to 30s, although 40s were reached around Walla Walla. Temperatures on February 11th finally reached the 30s and 40s in most of eastern Washington. Over 2 inches of rain fell at Stevenson, as wind speeds increased. On the morning of the 12th, sustained winds of over 40 mph were observed at St. John and Garfield East, along with gusts of 58 mph at Dayton. Rain continued, especially in the west, with 1.75 additional inches falling at Stevenson. Morning temperatures were very mild due to the strong wind, with some locales starting the day in the 50s. Precipitation fell across most of the state on the 15th, with heavy rain in southwestern areas, and heavy snow in the mountains. Rain continued in the west on February 17th, as mild breezes persisted in the east, and snow piled up in the mountains. 1.52 inches of rain fell at Puyallup, while 1.3 inches was recorded at Vancouver. Highs in south central Washington were in the mid to upper 50s again, with mild lows as well. Winds gusted as high as 54 mph at Fourmile. Highs ranged from the upper 20s to low 50s on the 23rd, as rain and snow fell in northwestern Washington. 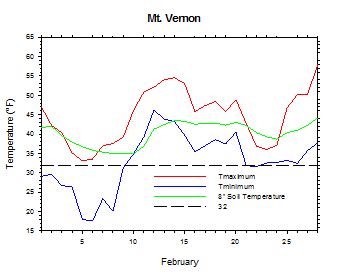 February 24th was another variable day, with a mild rain in the southwest, snow in Bellingham, and areas of mixed precipitation in central and eastern areas. From the 22nd to the 24th, parts of Whatcom County received more than one foot of snow. 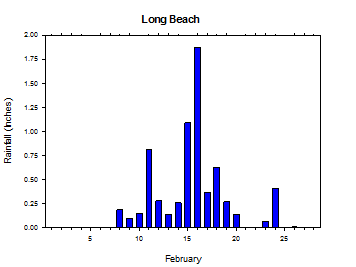 February 25th was a drier day, with highs in the 30s in the east, 50s in the west, and 60 degrees at Long Beach. Finally, calmer and warmer conditions arrived for the rest of February. 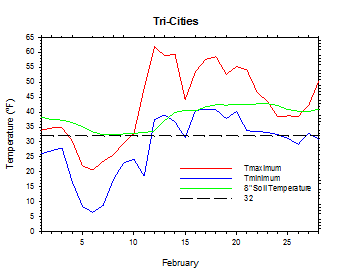 The average February temperature at Prosser (WSU IAREC) was 34.1°F, which is 3.7 degrees (1.1 standard deviations) below average. The average high temperature was 40.7°F, which is 5.8 degrees (1.4 standard deviations) below average. The average low temperature was 27.8°F, which is 2.2 degrees below average. The maximum temperature recorded last month was 57.7°F on February 12th, while the coolest daily high was 16.1°F on February 6th. 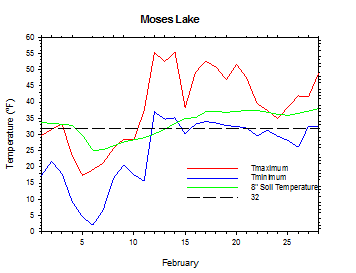 Low temperatures ranged from 39.8°F on February 13th to 1.3°F on February 7th. Daily average temperatures ranged from 49.8°F on the 12th to 12.9°F on the 6th. The monthly precipitation total was 0.61 inches. 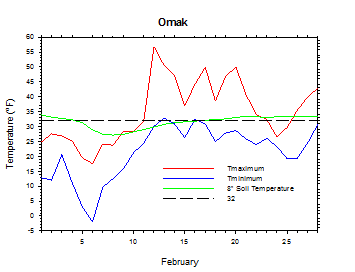 The average wind speed was 5.9 mph, and the average 8 inch soil temperature was 38.8°F. 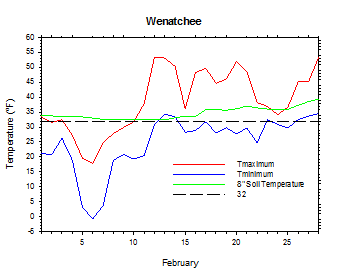 Wenatchee (WSU TFREC) recorded an average temperature of 31.7°F, which is 2.9 degrees below average. February 5th: The temperature at St. Andrews plummeted to -11 degrees. February 12th: The wind at Dayton gusted to 58 mph. February 12th: 1.87 inches of rain fell at Stevenson. 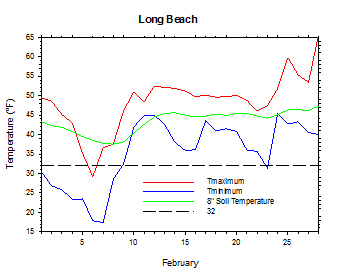 February 28th: The temperature at Long Beach soared to 66 degrees. A strong storm passage on December 1st dropped an astonishing 6 inches of rain at Stevenson in just 24 hours. However, cold and dry weather followed quickly in its wake, and persisted for the next seven to ten days. 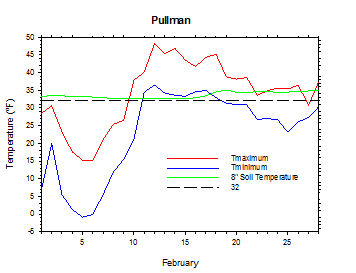 Prosser's temperatures remained below freezing for nine consecutive days, while Pullman dropped below -5 degrees for 5 straight nights. The remainder of December was generally inactive and mild during the day. While monthly mean high temperatures were only slightly below average, the mean low temperature was more than 7 degrees below average. The dirty ridge of mid to late December continued to dominate the weather in early January, before a series of potent weather systems affected Washington beginning on the 10th. The storms brought strong winds to the state, along with heavy west-side rainfall and mild temperatures. The weather calmed around mid month, and a stable ridge of high pressure controlled the weather for most of the latter part of January. Conditions were dry and mild in the mountains, but cool and foggy in the stagnant lowlands. Finally, more active conditions returned at month's end. 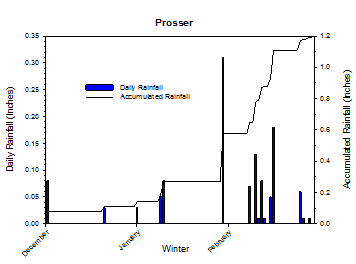 The average winter temperature at Prosser (WSU IAREC) was 31.9°F, which is 2.5 degrees (1 standard deviation) below average. The average high temperature was 39.3°F, which is 2.0 degrees below average, while the average low temperature was 25.4°F, which is 2.6 degrees (1.1 standard deviations) below average. Daily high temperatures ranged from 59.2°F on December 1st to 16.1°F on February 6th. Low temperatures varied from 43.3°F on January 13th to 0.6°F on December 8th. Daily average temperatures ranged from 49.8°F on February 12th to 9.3°F on December 8th. 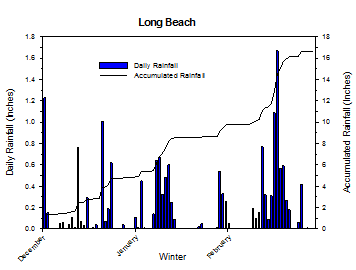 1.19 inches of precipitation fell during the winter season. The average wind speed was 4.3 mph, while the average 8 inch soil temperature was 38.3°F. Other locations also experienced below normal winter temperatures. 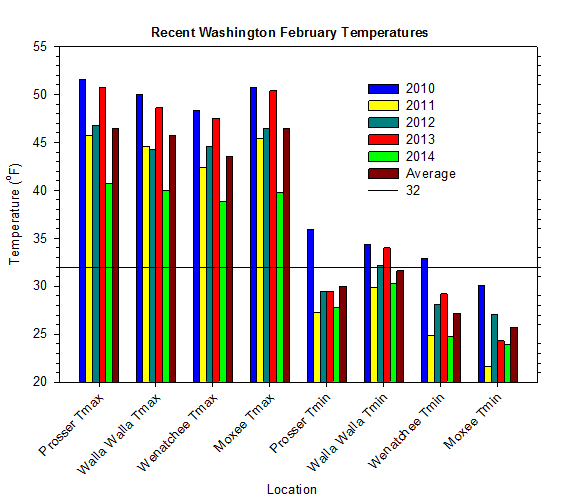 Wenatchee (WSU TFREC) had an average seasonal temperature of 30.6°F, which is 0.6 degrees below average. 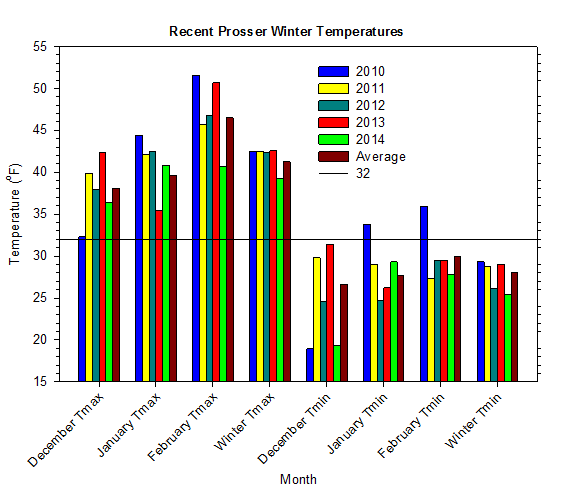 Overall, the winter of 2013/2014 was 3.5 degrees cooler than last winter at Prosser (WSU IAREC). December 1st: 6 inches of rain fell at Stevenson. December 8th: The low temperature at Pullman was a frigid -12 degrees. December 15th: The temperature at College Place rose to 62 degrees. January 10th: The wind at Wenatchee Heights gusted to 64 mph. January 13th: The high temperature at Ellisforde reached a mild 65 degrees. February 7th: The temperature at Wapato fell to -8 degrees. December: Early arctic blast, then mild and dry. February: Early arctic blast, then stormy. Although there was continued concern about potential cold damage from the December and February arctic outbreaks, many crops seemed to be faring well. Fortunately, increasing mountain snowpack allayed some of the early winter concerns about a potential 2014 drought (NASS). 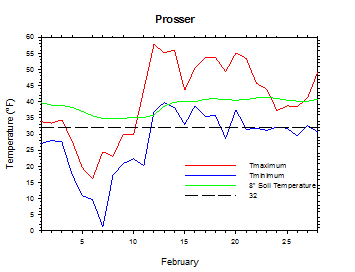 On February 3, 1996, the temperature at Prosser (WSU IAREC) plunged to -13 degrees. According to the Climate Prediction Center (CPC), above average temperatures are expected from mid spring into the autumn of 2014, along with potentially drier than average conditions during the late spring and early summer. El Niño is likely to develop this summer, although the ultimate magnitude of the event is still in question at this time.